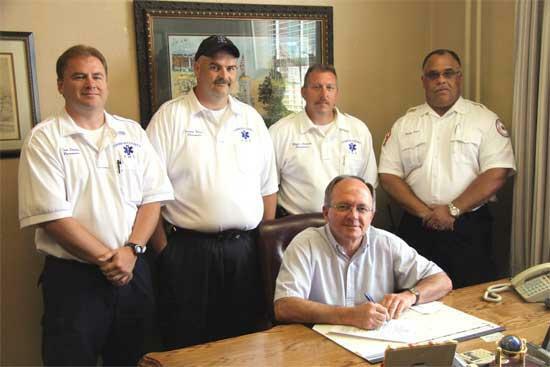 Members of Cannon County’s Emergency Medical Service joined County Executive Mike Gannon Friday as he signed a document proclaiming May 15-21 as “National Emergency Services Week” in Cannon County. Observances run 15-21 May, with 18 May set aside as Emergency Medical Services for Children (EMSC) Day. This year’s theme is Everyday Heroes, and according to FEMA Regional Administrator Ken Murphy, it’s all about celebrating EMS providers — first responders, hospitals, emergency physicians and public health providers, and engaging the Whole Community in reducing risk and saving lives. On hand for Friday’s proclamation signing were, from left, paramedics Dek Sissom, Jeremy Young, Roger Lovvorn and EMS Director Ricky Cope.